Wisconsin educator Katie Titler introduced me to a free resource called iPadio about 5 months ago. Ever since I have been playing with the resource. 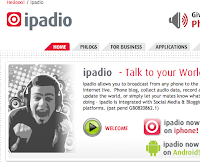 iPadio is created in the UK and works globally! It allows anyone to use their phone to record "phlogs". Which are really just audio files posted to the Internet and given an RSS feed. 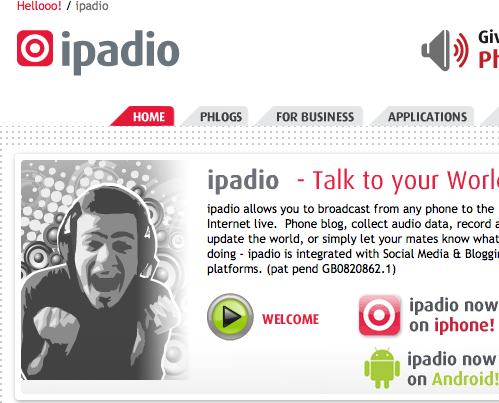 iPadio also allows for cross-posting to just about any website or blog! This means that you can call in to the iPadio number (any phone will work), record an audio post, and have it immediately show up on your blog, wiki, or other website (without having to copy and paste embed code). Therefore it works in a similar fashion to my old favorite cross-posting site Gabcast (which is no longer free). It can also work with multiple phone numbers. I have recently used it with my students to do homework reflections that post directly on their blogger blogs. While it does take about 10 minutes to set up, once it is set up, you only need to make a call when you want to record an audio post. Besides oral reflections, this is a perfect tool for doing school-related podcasting! Thanks for sharing this resource, Liz! I already signed up, downloaded the application from iTunes, and am super-excited to post my first phlog. I loved using the site phonecasting.com, but it wasn't as intuitive as this in terms of posting out to other webspaces like blogs, twitter, and facebook.